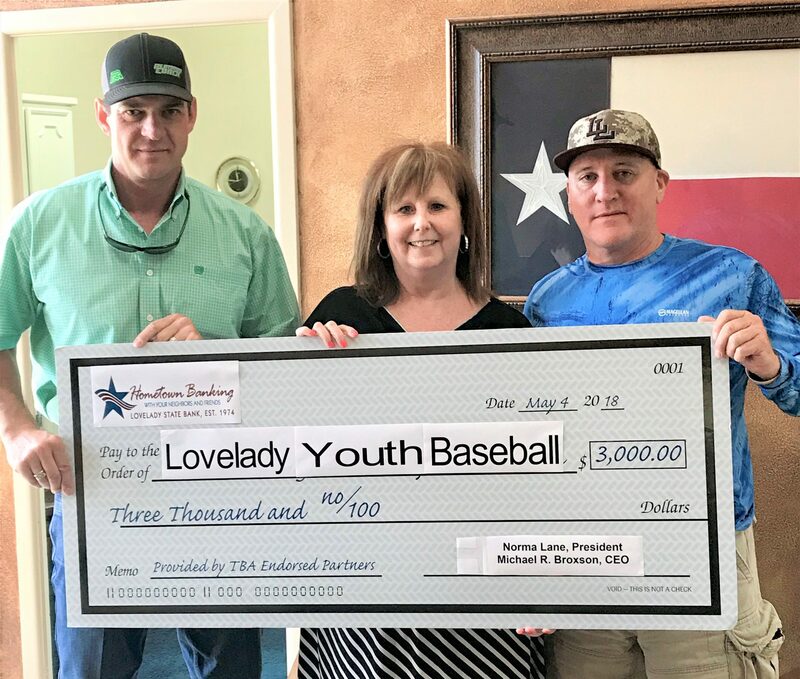 LOVELADY – The Lovelady Youth Baseball program received an unexpected donation earlier this month. Lovelady State Bank (LSB) President Norma Lane was at a recent Texas State Bankers Association (TBA) convention where she won a contest. The prize for this contest was a $3,000 donation to a charity of the LSB’s choosing. Lane chose to donate the $3K to Lovelady Youth Baseball, specifically towards the organization’s field development account. “I chose Lovelady Youth Baseball because we at Lovelady State Bank happily support the youth of the community,” Lane said. “We feel the new baseball complex is a great way to help shape and mold children’s lives through the camaraderie that comes from learning and playing a team sport. I give a huge thank you to TBA’s Endorsed Partners for making this donation possible,” she explained.